According to the latest numbers crunched by pingdom, people are finally migrating from Windows XP to Windows 7. That is, for the U.S. market at least. The data comes from aggregated visits to over 3 million websites (so for you survey OCDs out there, yes, there’s a huge enough sample group). Since it’s launch, usage of Windows 7 has been on a steep rise, indicating how much right Microsoft did with Windows 7. 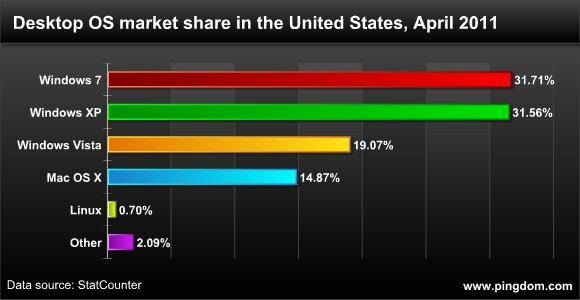 In comparison, Vista never even got close to XP’s market share :/ Poor Vista. Yep. Windows 7 is still up top.